Women with MBC often prefer Thriver, Meta-Thriver, Lifer or Forever Fighter. Komen is committed to working with our Stage IV sisters to ensure they feel welcome and included in all our events. 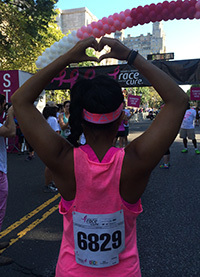 At the Race for the Cure, we dedicate the annual Thriver Award to a woman with MBC who doesn’t sugarcoat the hardships of living with Stage IV disease but recognizes there is hope that can be found throughout all of her struggles and who holds onto hope at every turn in life with humor, courage, and grace. Learn more about metastatic breast cancer and Komen research on MBC."